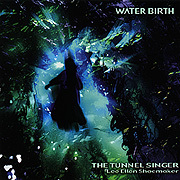 A rare find is Water Birth by The Tunnel Singer. It is one of a very few albums of ethereal/spacemusic that is entirely acoustic in nature. Using only her voice and the lenghty natural reverberation of her unique surroundings, Lee Ellen Shoemaker's (aka The Tunnel Singer) vocalizations span a range of dreamy styles. From the floating ambience of the track "Rememberance" to the near avant-garde swells of "Ojibway", Shoemaker creates spellbinding, compelling vignettes evocative of location and mood. Her music is unprocessed in the studio and is the result of the natural play of harmonics, overtones and reverberation within the empty 2 million gallon cistern where the album was realized and recorded.